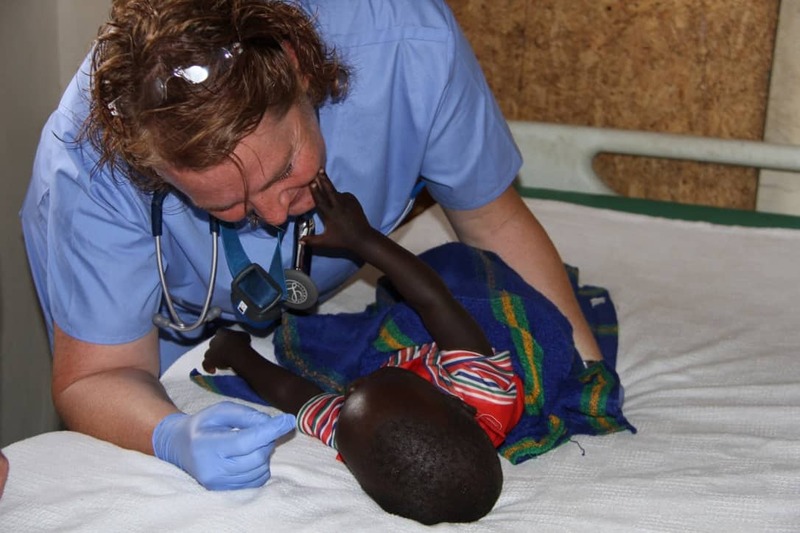 In June, we were able to take our first medical team to northern Uganda. A team of 10 from Cheyenne Hills Church included two doctors and 3 nurses and five support team members. In seven clinic days we were able to see 1,260 patients and many many more we had to turn away — demonstrating just how great the need for medical attention is in Northern Uganda. For three days we worked out of the clinic container supplied by Homes of Living Hope (and outfitted by BRHS), serving the people in the community of Aloi. There is no other medical facility in their area. Their only option is a prohibitive 23km trip into Lira. While this clinic was not designed to handle the type of crowds we saw or this many medical professionals, it was a blessing to have such a facility in that area. We spent our other days outdoors with a canopy tents and some tarps hung to create private treatment areas. In the Aloi clinic, we treated a wide variety of patients with an even wider variety of conditions, but the most wrenching were three infants brought in limp and lifeless. All were suffering dehydration from malaria. Our team was able to start IV fluids for them and give them appropriate malaria meds. I’m happy to report that each child left that day alert and responsive smiling, even after the trauma of the IV needles. While retaining medical professionals and keeping the clinics open and stocked with supplies is an on-going challenge for all of northern Uganda, having a facility like this when professionals and supplies are available is an incredible blessing. The people of Aloi and the other villages showed huge appreciation of our presence and help. The smiles they gave when we greeted them carried us through many tough cases. One of the hardest parts was the fact that we couldn’t help everybody. Some we were only able to diagnose then present them with other options they could explore. Those individuals didn’t turn away discouraged, but instead with a new joy that they now could find a solution to their problem. In addition to treating a wide variety of medical issues, we also administered 560 Hepatitis B vaccines. After the initial dose, the government will provide follow up doses. This ensures that people won’t contract a very preventable condition. The hardest part of this trip was the number of people we were forced to turn away, just because of the sheer volume of patients. Those that weren’t able to see a doctor that day were willing to wait all day and even come back the next. The influx continued throughout our entire trip. Our team faced exhaustion as they treated patient after patient. Seeing 1,260 patients in seven days leaves little time for breaks or rest. This was by far the most difficult trip I had been on. This trip wasn’t just 10 “mzungos” coming to Uganda to temporarily treat these patients. We had countless local Ugandans with us who were translating, administering immunizations, running labs, assisting the doctors and nurses, and triaging. We are so appreciative local professionals that worked alongside us during our time there. Their skills and experience was invaluable, and we wouldn’t have been able to accomplish all we did without them. Our trip shows what has motivated Homes of Living Hope- consistent medical care is a dire need in Uganda.